CHAI Kreative & Advisory is much more than award-winning advertising & consulting agency. We tailor identities and base our work on a philosophy that has elevated the human mind and spirit throughout history. We believe in thinking things through, avoiding unnecessary noise and basing our relationships on values that really matter and results you can see and experience. Balance between productive thought and precise action is key. We call ourselves CHAI exactly because we achieve more over a cup of chai than most do over dozens of e-mails. This is why we kindly invite you over to pause for a minute, have a cup of chai with us, focus and with the help and guidance of our team of experts, create a comprehensive and dynamic game plan that will take your business to the next level. We help businesses grow by helping people grow. A new level will require new skills and a mindset to match. Fuelled with in depth knowledge, contacts and more than a 60 years of collective experience in the fields of creative solutions, technical advisory, brand building - both, short- and long term; we will take you and your business further than you can imagine today. Our committed team is at your service and the cup of chai that will transform your visions and goals to reality is waiting - the only question is "are you ready to drink it?" A consistent brand is an essential business asset that increases sales and promotes customer loyalty. CHAI Kreative & Advisory’s customizable brand audit and reporting program is designed to identify the distinctive needs of your clients, thus helping ensure the integrity and proper development of your brand marketing and communication across all relevant touch points and channels. Our advisory services are designed to help our clients with one thing, their strategy. Whether it is product strategy, service strategy, market strategy, messaging and positioning strategy, or vision casting, we embed ourselves in the process and engage with decision makers to help them gain the most effective competitive edge, see the market trends in the big picture, and think strategically about their direction and product or service portfolio. It is our core concept to think, focus, study and take surgical action in delivering long term results in terms of financial results, business reach and elevating your intrinsic value. Tailored for companies looking to penetrate the Indian market and companies that are looking for business with the government and within the public sector. 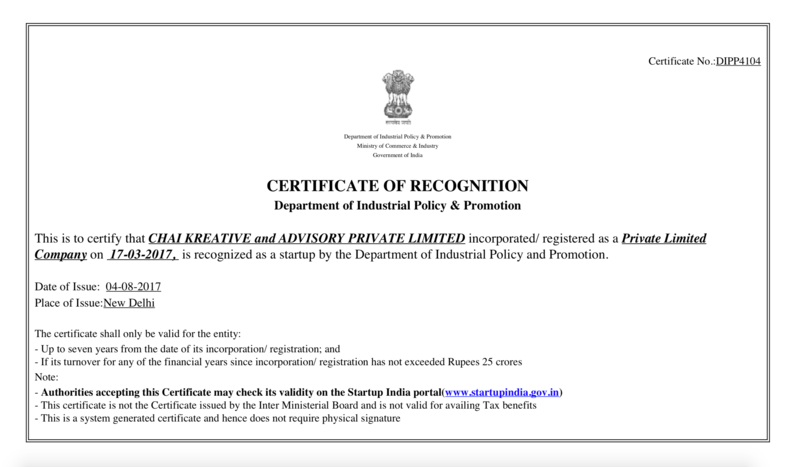 At CHAI Kreative & Advisory, we partner with Indian government institutions with the aim of establishing sustainable partnerships with companies and business models that aim to generate value for the industry as a whole. Our extensive relationships and experience with the Indian market and Government enable us to provide tangible value to your business and expedite your success in the market. Our services are relevant to companies of all sizes. From freshly established enterprises to conglomerates with decades of experience or government agencies and projects. We cater to foreign companies entering India and companies based in India looking for business in government projects and public sector. With our contacts, decades of experience and knowledge - we can help you get a better starting position and we can keep helping you grow. CHAI Kreative & Advisory is an efficient and effective partner for you in brand auditing, defining your needs and brand building to reach your goals.